We broke down numerous times, spent hours on the phone with techs, had some help from friendly troopers, and went through at least 8 fuses before the Beast finally wouldn’t start. We were dead on the side of I-25 in Kentucky on a blistering hot day. It was only Day 5 of our U.S. “tour” and the rig had only a few thousand miles on it. 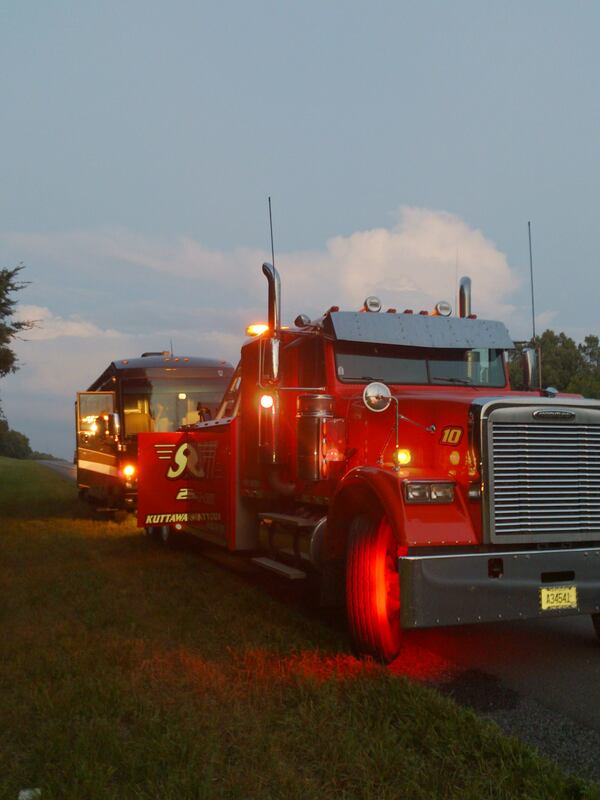 By nightfall, we had been towed to the Tag Trucking facility in Calvert City, KY, where the next day, the savvy mechanics there discovered that the ignition wire had frayed in two against the drive shaft. The repair was simple, but the wait for another tow truck to move the RV into the repair bay caused a delay that put us exactly a day behind our schedule to meet Greg in Salt Lake City. We drove for three very long days instead of four from Kentucky to Salt Lake to make up for the loss, and made it just a few hours later than we’d originally planned, albeit drained. We made it to Park City, Utah after sending off our second happy college freshman, only to say, “Another day, another problem.” I might have to write a Thor Tuscany 45LT smackdown someday soon, but for now, suffice it to say that a dozen problems are on our list of things to fix at our stop near an authorized service center in Vegas in a couple weeks. One of the more serious issues on our two-month-old 45′ coach was the unexplained intermittent loss of our engine brake, at the same time that our tow battery died (again), causing the loss of our supplemental braking system, which brakes the car when we’re going down a steep hill or if we need to brake suddenly. We lost these two important braking system components the same day we crossed (and went *down*) the northern Rockies. 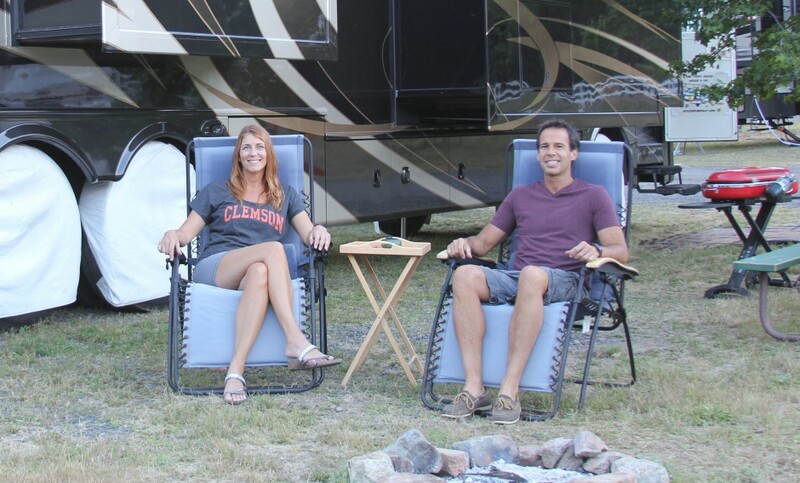 The Continental Divide near the Wyoming-Utah border has admittedly much smaller mountains at 6000-8000 feet than the 14,000-footers of Colorado, but still the RV brakes were smoking as we descended into Park City on a Friday night to visit my childhood friend, Jean Marie. Made it! 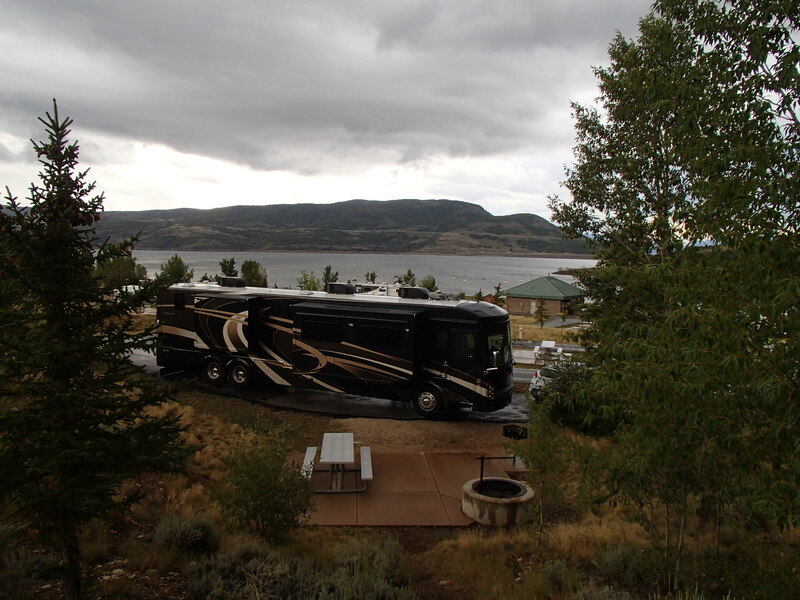 The HMS Love Shack at her docking pad at Jordanelle State Park reservoir, near Kamas and Park City, Utah. But all was soon forgotten as we parked the RV at one of the most beautiful spots we’ve seen yet at Jordanelle State Park near Park City and Kamas, Utah. My friend Jean Marie is a transplanted city girl who lived in Philly and Manhattan for years, and moved out to Utah lock, stock and barrel without knowing a soul. She bought a Jeep, a horse, and got a dog, in that order. Now she has a sensible truck, two horses, two dogs, and has greatly improved her skiing. I couldn’t wait to see her in her new life. Jean’s world has two sides, she explained. There’s the touristy ski town that is Park City, where Alta, Snowbird, Canyons, Deer Valley and several other major award-winning ski areas are located. Park City hosts the Sundance film festival every January. So part of any visit to this area must include seeing the charming little main street of this town and enjoying the art galleries, shops and great restaurants, including the No-Name Saloon and Grill (shown here; note the vintage snowmobile suspended from the ceiling). 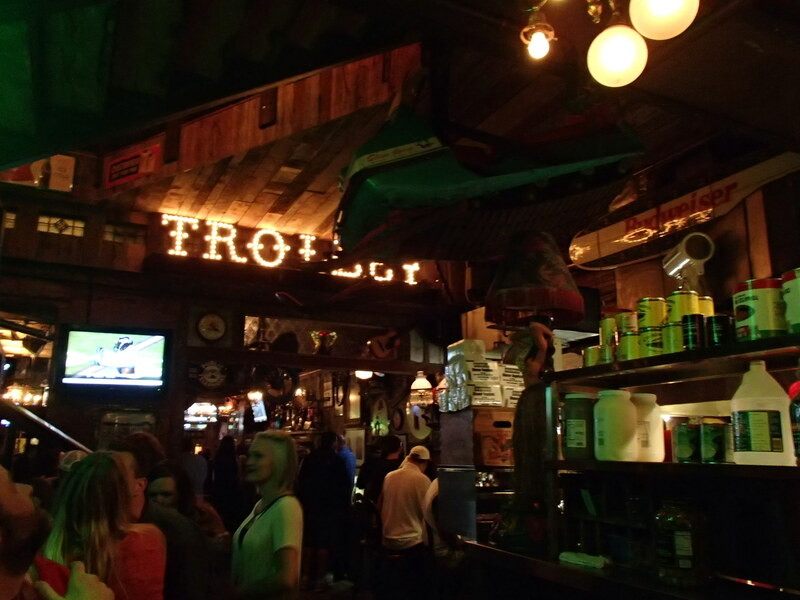 The inside of the No-Name Saloon and Grill in downtown Park City is an eclectic, quirky mix of frontier and ski culture. Mitch gets grounded with some peaceful beauties at a friend’s ranch in Oakley, Utah. 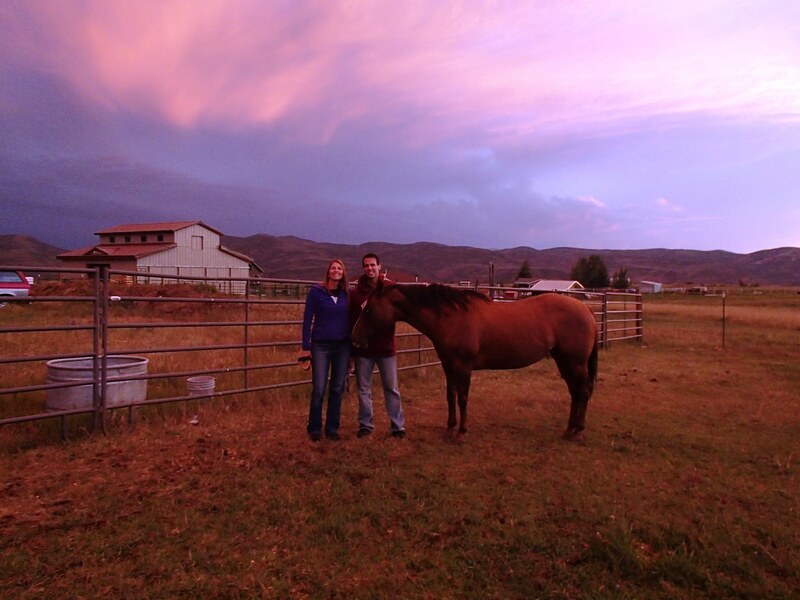 Sunset in Oakley, Utah was made even more magical with the charm of a neighbor’s sweet horse. 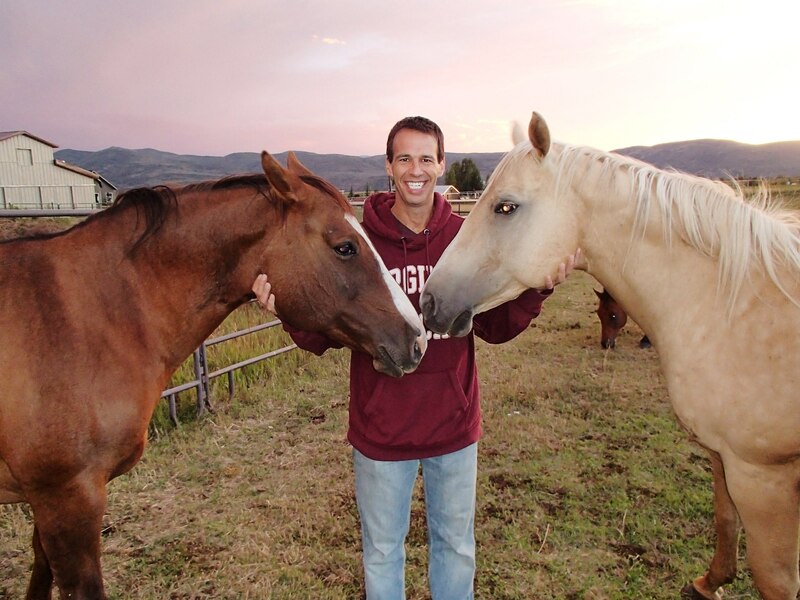 Part of the magic of Utah for me on this trip was definitely about Jean’s animals. 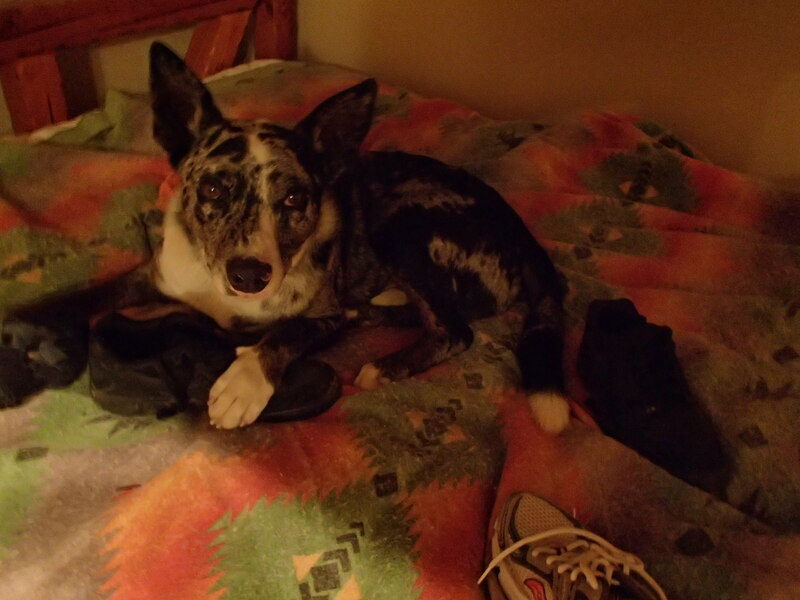 One of Jean’s dogs, a herding breed named Dollar, kept stealing Mitch’s shoes (but not mine). About six times, he stealthily absconded with Mitch’s sneakers and nested with them on the bunk beds in Jean’s guest bedroom. Another time, he had taken one out into the yard, where Jean retrieved it just before it poured rain. Dollar “taking care” of Mitch’s shoes. He did not chew them up, mind you, just took them off to cuddle with. 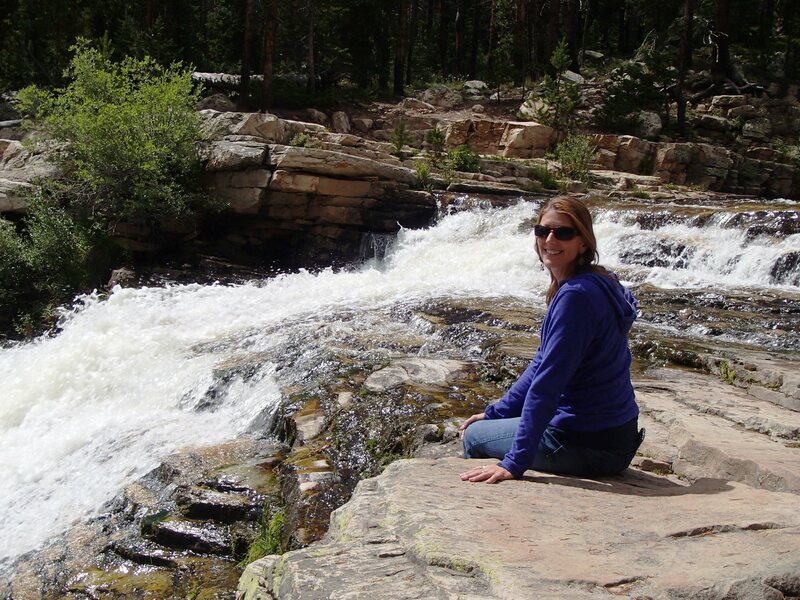 We also had the pleasure of taking a day trip in our Veloster to the Uintas National Forest, where we passed through Bald Mountain pass at 10,700 feet, marveled at the swollen waters of the Provo River Falls and walked the mile-plus path around Mirror Lake. These are some of the reasons I’ve always said Utah is one of the most underrated states in the U.S. to visit. 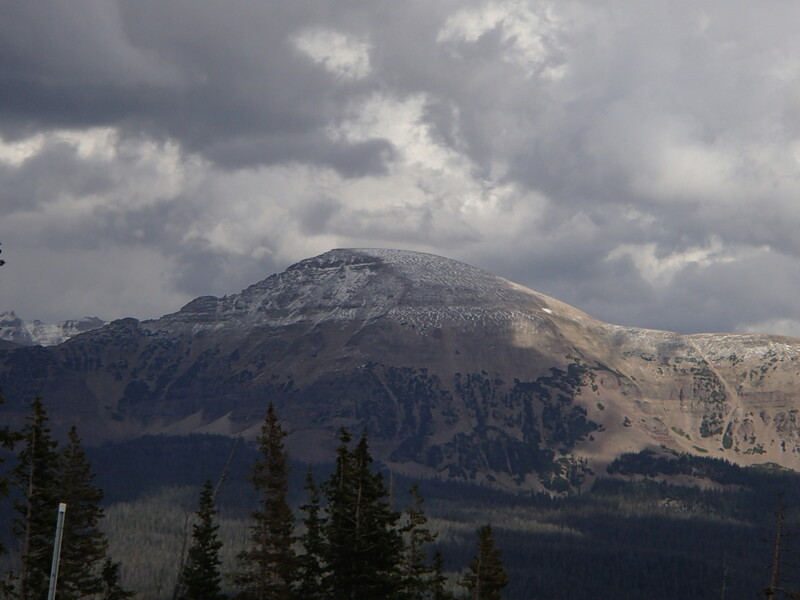 The view from Bald Mountain Pass at 10,700 feet revealed a dusting of snow from the previous night on the nearby peaks (Aug. 24, 2014). Val enjoying some high-altitude sunshine at Provo River Falls. The short walk back up to the car had us gasping for breath at 9000+ feet. 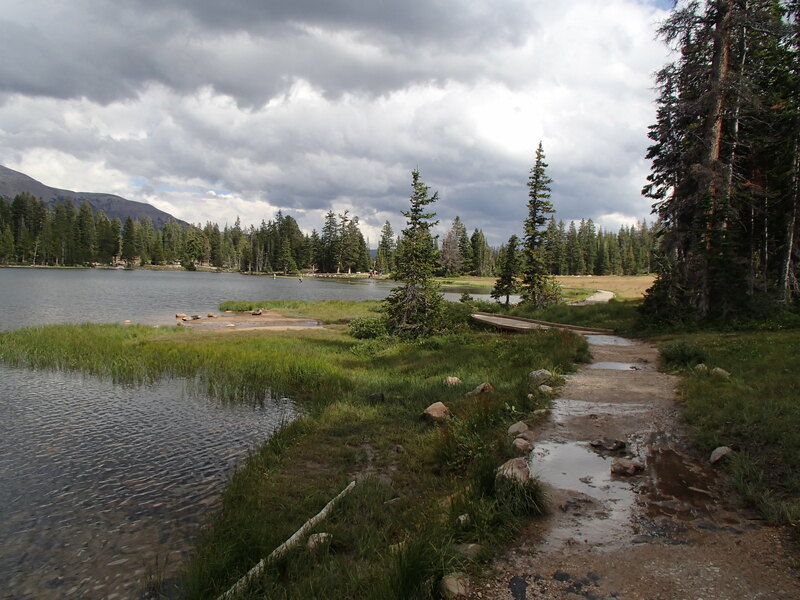 A beautiful path winds around the high-altitude Mirror Lake near the Utah-Wyoming border. Our weekend left us relaxed and happy, and we headed toward our next destination on Monday: my hometown of Reno and a week at Lake Tahoe. As much as I love Utah, just crossing the border into Nevada makes me happy, in spite of the ubiquitous casinos…or why not–because of them–who doesn’t love 24-hour breakfast and free cocktails for putting some quarters into a slot machine? The motto of my alma mater, University of Nevada, Reno is, “Once Nevada, always Nevada.” And just so you know, it’s Ne-va-da, not Ne-vah-da. I remember billboards that used to say, “Where the hell is Winnemucca?” (The answer: in the middle of nowhere off I-80 in NV). 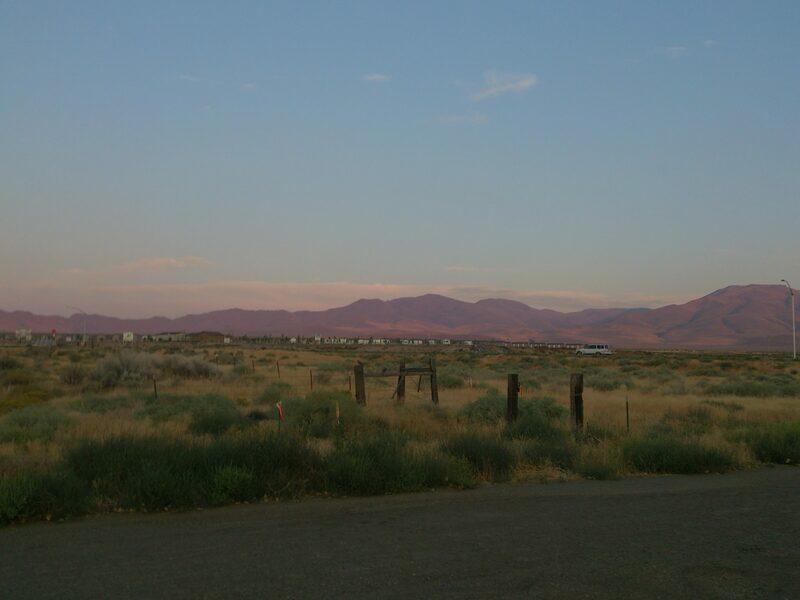 I heart Nevada’s pink mountains at sunset, seen here from the High Desert RV Park in Winnemucca. To Utah, I heart you too, and we’ll see you again in a couple months (Beast be willing) when we trek north through your canyons and arches, and then again when we bring the kids for skiing in December. In my next post, we live 24 Hours in the Life of a Rock Star! Great storytelling Val! Look forward to reading future installments of your love shack adventures!